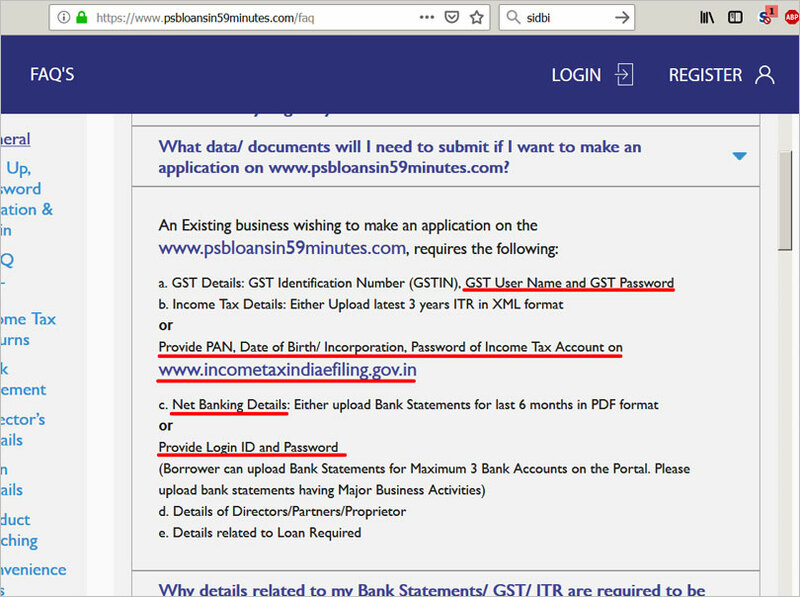 psbloansin59minutes.com Seeks login ID, Passwords of Income tax, GST, Bank Account ! psbloansin59minutes.com Seeks login ID, Passwords of Income tax, GST, Bank Account! The Diwali gift from prime minister Narendra Modi to the micro, small and medium enterprises (MSME) sector, may well turn out to be a privacy and security nightmare for small businesses seeking 'easy loan'. The prime minister had announced that there would be a dedicated digital platform to enable MSMEs secure in-principle approval for loan proposals of up to Rs1 crore in just 59 minutes. To enable quick and algorithmic processing of loan, Small Industries Development Bank of India, with help from CapitaWorld, set up psbloansin59minutes.com. Any MSME entrepreneur, who is seeking a loan, needs to fill up forms and provide details on this website. Shockingly, while filing the application form, the portal asks MSME loan seekers to provide login ID and password for income-tax (I-T) website and bank account and username and password for goods and services tax (GST). It asks the applicant to provide details of GST, I-T, net banking, directors, partners or proprietor and other details needed for the required loan. Under the GST details, it asks the borrower to provide GST Identification Number (GSTIN), GST User Name and GST Password. For I-T details, the applicant has to provide I-T returns of the past three years in XML format or provide permanent account number (PAN), date of birth or incorporation (of the firm), and "password of income tax account on www.incometaxindiaefiling.gov.in". As if this is not sufficient, the applicant is asked to provide bank statements of past six months in PDF format or provide "login ID and password" of bank account. Shocking, isn't it? The moment you part with your user IDs and passwords for I-T, bank account and GST, anyone can easily misuse these details. Without providing details of GST, ITRs and bank statements or the alternative of sharing login ID and password, you cannot proceed further. Why does any website need sensitive and private information like login IDs and passwords of I-T efiling portal and bank account under the pretext of providing in-principle loan approval? Talking about data safety and security, psbloansin59minutes.com admits, "The portal collects sensitive data for real time loan evaluation process. Your data is safe with our cloud servers." 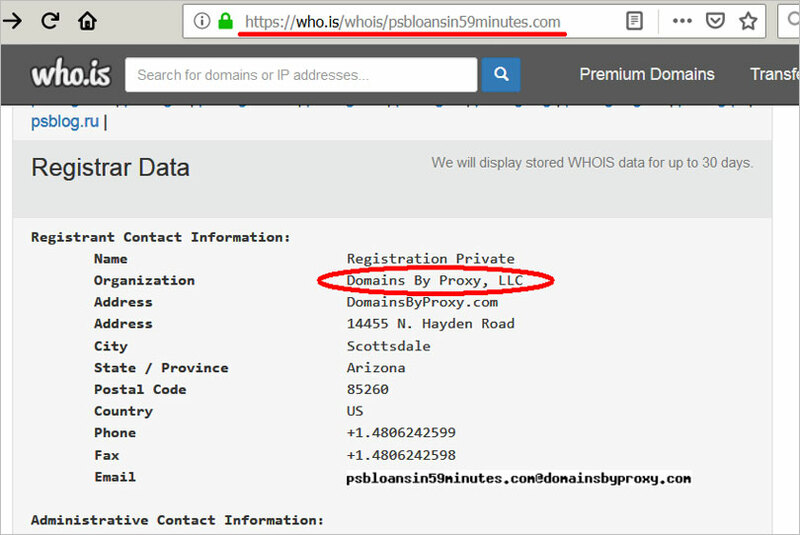 In addition, there no information available about ownership of the website, psbloansin59minutes.com, which is created to collect information from MSME loan seekers. All the information about ownership of this portal is hidden behind a proxy, reveals Who.is data. For registration, as they would like to call this process of collecting all information, there is no fee charged. However, if the borrower wants to receive an ‘in-principle approval’ he needs to pay Rs1,000, plus applicable taxes. In addition, the portal clarifies that ‘in-principle approval’ from the website does not mean the loan is sanctioned. “After offering in-principle approval, the preferred lender (as selected by borrower) will conduct a thorough due diligence and decide on whether to sanction/disburse the proposal. The final decision will be at the lender’s discretion,” it says. Responding to this article, Blue Lotus Communications Pvt Ltd, a PR agency of CapitaWorld and SIDBI led consortium of PSBs, said, "The portal www.psbloansin59minutes.com is owned by CapitaWorld, which is owned and controlled by consortium of public sectors banks and financial institutes, including State Bank of India, Bank of Baroda, Punjab National Bank, Indian Bank and Vijaya Bank. SIDBI group, along with a consortium of banks, now holds 54% stake in fintech startup, which can be extended to 76% after achieving pre-defined milestones. Currently, four out of the seven directors of CapitaWorld are from public sector institutions. There has not been any stake sale and all the money invested by Banks is being used for the development of platform." Talking about fee charged from borrowers, the statement says, the portal charges a success fee from banks in respect of all disbursed cases out of cases sanctioned in principle. It says, "This success fee is payable by banks and entitles the Banks to receive following additional services like credit appraisal memorandum, CMA preparation, MCA/other database access resulting in shorter credit delivery cycle. It may be mentioned that the platform may take a few years to break even." Peri Maheshwar, publisher and founder of Careers 360, has posted these very pertinent facts and questions on social media about this site. 2. Capitaworld Platform is a company incorporated on 30 March 2015. 3. The company is registered in Ahmedabad, Gujarat. 4. As of 31 March 2017, the company did not start operations and had a revenue of Rs15,000. 5. The signatories of the company are Jinand Shah and Vikas Shah. 6. Another director on the board is Vinod Modha, A strategic advisor for corporates including Nirma and Mudra (Owned by Anil Ambani). 7. All loanees have to pay Rs1180 on application and 0.35% of the loan as processing fees. 8. CapitaWorld makes it’s money from the banks who in turn load it on the customer. 9. This Ahmedabad based private company will hold our data with serious connotations - net worth etc. 10. After March 2018, the company inducted 4 new directors. One of them, Akhil Handa ran Modi’s 2014 campaign. 1. How can CapitaWorld sanction a loan and tag the bank? What is their locus standi? What authority? Quite simply, the sanction doesn’t mean a scrap of tissue paper. In our language, it is a lead generation platform? 2. How were they chosen? Criteria? Qualifications? 3. They were neither operational nor had experience. How were they short-listed? 4. Shahs, Ahmedabad, Gujarat. Too many coincidences? 6. How was such a massive project trusted to a company with no experience? 7. What were the terms of the contract? 8. Any projections on how much CapitaWorld makes? 9. Is it true the Rs1,160, we paid goes to CapitaWorld and also a part of the 0.35%? Imagine a million SMEs applying? 10. Anything on data privacy and non-disclosure agreements? They made SIDBI, State Bank of India (SBI) and other banks to invest Rs22.5 crore at a share premium of Rs119 per share in June 2018. For a company without any operations, revenue, track record, and even the proven product, these PSU banks invested a premoney valuation of Rs19 crore. They must have used this money to develop complete product. It is a full circle. Now, they will tell that all these banks are shareholders in that company with ownership of more than 50% and hence, it is like semi PSU. The most depressing aspect of the scheme, of course, is that public money from the public sector banks are being used again by politicians to dole out money under the garb of helping MSMEs. The loans under 59 minutes scheme are fully guaranteed by the Credit Guarantee Trust which means banks have no responsibility to recover the money! This is a scam ! How do they use the information collected ? How long do they retain it ? Do they sell the information to other enterprises ? A govt of the thieves, by the thieves, for the thieves. The Pradhan Mantri Awas Yojana(PMAY) has brought a series of benefits for first-time homebuyers. A subsidy on your home loan interest is one of the prime advantages that PMAY extends to you. Claiming the subsidy on your home loan is easy basis your eligibility, if you apply for the Pradhan Mantri Awas Yojana according to your income and buy a home that fulfils the carpet area norms set out by the scheme. You or your family cannot be the owner of a pucca house. Being an existing homeowner declares you unfit to apply for a home loan under PMAY. You or your family should not have availed facilities and benefits of another government housing schemein the past. You need to have an Aadhaar Card to apply for the Pradhan Mantri Awas Yojana. To be eligible for PMAY under the LIG category, your combined annual household income should be between Rs.3 lakh to Rs.6 lakh. To qualify as a MIG-I applicant, your annual household income should be between Rs.6 lakh and Rs.12 lakh. To qualify as a MIG-II applicant, your annual household income must not exceed Rs.18 lakh. What is The Maximum Subsidy that You can Claim? You can enjoy a subsidy of up to Rs.2.67 lakh on your home loan under the Pradhan Mantri Awas Yojana. The percentage of subsidy that you can claim depends on the income category you fall under and the total carpet area of the house you buy. Here’s what you should know. If you fall under the EWS or LIG category, you can claim a credit-linked subsidy of 6.5% on a home loan of up to Rs.6 lakh. The carpet area of the home you buy should be 30 sq. mt. if you apply under the EWS category and 60 sq. mt. if you apply under the LIG category. Under the MIG I category, you can claim a credit-linked subsidy of 4% on a home loan of up to Rs.9 lakh. You can claim this subsidy if the home you buy has a carpet area of 160 sq. mt. Under the MIG II category, you can claim a credit-linked subsidy of 3% on a home loan of up to Rs.12 lakh. You can claim this subsidy if the home you buy has a carpet area of 200 sq. mt. There is no limit to the loan amount, however interest subsidy will be calculated on a maximum of Rs. 6 lacs for EWS/LIG, Rs. 9 lacs for MIG I and Rs. 12 lacs for MIG II. The carpet areas for MIG I and MIG II category has been revised recently. This revised mandate allows you to purchase a bigger house on subsidy now. However, the important thing you must remember is that the PMAY subsidy is applicable for a maximum considered tenure of 20 years. You can gain subsidies on your home loan even if you use funds from your sanction for renovation and construction purposes. The only exception here are MIG I and MIG II applicants. As a representative of these two income categories, you cannot use funds from your home loan to do anything else other than buying a home. Also, under PMAY-G (Gramin) segment, you can claim a credit-linked subsidy of 3% on your home loan of up to Rs.3 lakh. So, say you take a home loan of Rs.12 lakh on a 9% interest rate. Then your EMIs will be Rs. 17,995 and your total interest cost for 20 years will come up to Rs.23.19 lakh. Now, you are eligible for a 3% credit-linked subsidy, which comes up to Rs.2,30,156. When this subsidy amount is deducted from your loan amount, then the revised loan amount will be Rs.9,69,844. How to Claim the Subsidy? Once you enrol for the Pradhan Mantri Awas Yojana, you can apply for a home loan with a lender of your choice. Here, be sure to select the one enlisted under PMAY. The next step will be to compare various lenders and loan offerings according to the home loan interest rates. As soon as your application gets approved, you will receive your loan amount in your account. The lender will then claim subsidy on your behalf from the government. When the lender receives the subsidy, they will credit it into your home loan account and your EMIs will decrease accordingly from there on. This means that initially while repaying your home loan you will have to put forward EMIs with respect to the normal interest rate. It is only after a few months, when your lender’s application on your behalf is approved by the government that your EMIs will decrease and you will get compensated for the excess you have already repaid towards your interest obligation. You can considerlenders like Bajaj Finserv to avail a Home Loan of up to Rs.3.5 crore at an affordable rate of interest. Make sure you check your pre-approved offer and enjoy a more convenient as well as a better repayment experience on your home loan. my Loan is Single and my allotment are also single i applied the PMAY but the bank has reject my application due to the property are female member or joint ownership with wife than I add my spouse name as co- allottee in allotment letter as I am legible to PMAY. I had applied for subsidy of home loan under, pradhan mantri avas yojna, but still not received, so how to I know, when I will get it. I am now trouble with money, please help me. Hi Nishant...is it true that woman ownership is mandatory get subsidy in LIG schemes ? Your home loan interest rate usually depends on your lender, the central bank’s policies, and the current economic climate in the country. During times of inflation, the Reserve Bank of India (RBI) may hike the base rate, which may impact your home loan interest rate and subsequently your EMIs or your tenor. Longer the tenor, higher the amount you pay towards your interest on the home loan. Here are a few tips to help you manage the home loan interest rate hike. You can try negotiating the loan terms that your lender puts forth. Instead of agreeing with the repayment burden when there is an interest rate hike, it may help to speak to your lender first. A home loan EMI calculator may help you check the likely impact of the interest rate hike on your tenor and EMIs. Compute to see what suits your repayment schedule better. You can then negotiate with your lender asking them to adjust the home loan interest rate hike with your tenor or EMIs. Since the home loan amount is huge, increasing the tenor by 1-2 years owing to a spike in interest rate will decrease your burden momentarily. But remember, the longer you take to repay your loan, the higher will be your overall interest payment for the loan. So, ask your lender if they can consider restructuring your home loan on terms that suit you. together your extra income, bonus from your employer, and your savings or investment earnings. Use this handy cash to prepay a bigger chunk of your loan. This will immediately decrease your main principal amount and reduce your EMIs. So the new home loan interest rate will not be applicable on your whole borrowed sum. A word of caution: Take this step only when your prepayment amount brings you a bigger relief and considerably reduces your tenor or EMIs. You can use the home loan prepayment calculator to determine the changes you will face owing to prepayment on your loan. Dip into your savings only when you are convinced that it is a viable option. In case you face a rate hike on your home loan, you can try getting your loan refinanced with another lender, say an non-banking finance company (NBFC). Lenders like Bajaj Finserv offer a Home Loan Balance Transfer facility, where you can switch your existing home loan without any hassles. This will not only bring down the interest rate on your home loan but also give you access to additional benefits. These include features like the Flexi Hybrid facility, 3 EMI-holiday, top-up loans, nil foreclosure charges and more. As a start, you should consider the possibility of a rate hike right when you avail a home loan. Basing your choice of a lender on the interest perspective will help you start your loan journey with ease. my uncle has taken loan in 2004, with roi 7.75%, he never checked today icici bank is charging them 13.85%, in his loan paper tenure is 240 months after almost 14 years they are saying you still have to pay for 145 months, i am moneylife customer learned lot about finance thorugh your website, this cheating according to me, now they are saying if you want to reduce rates you have to visit their branch, they are not provide call records also, i have taken conversation id its - sr582296744, can you help me in this case, print some article how housing loan customers are getting cheated, we pay EMI on time not even single emi has been bounced in last 14 years...!